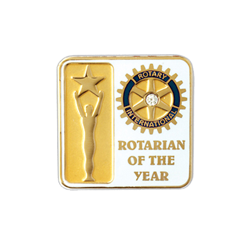 1-1/16″ 22k gold plated Rotarian of the Year lapel pin w/clear spinel in center of the Rotary wheel. Blue & white cloissone. Includes tie tac back and 3″ x 4″ presentation card w/blue imprint.